This is The Disney Store's Trivia Competition Pin. This pin was awarded to the individual store's contestant for this once-a-year Companywide event. I was proud to "win" this pin 4 consecutive times, and it was not an easy pin to win. For a store to qualify to send a contestant to the Competition, the Cast Members at that store had to answer a questionnaire each month about Disney trivia (for about 9 months). Every Cast Member could help find the correct answers to the questions, and at the end of the month, the answers would be submitted to "Home Base" with the answers. If the store could answer 90 percent of all questions correctly overall on average (for 9 months), the store would qualify to send a contestant to the competition. Once the store qualified, they would hold an "in-store" competition among all store Cast Members. The Cast Member who answered the most questions correctly would win a chance to compete in a live District competition. Every contestant was scored. The highest 10 scoring contestants in the United States and Canada were flown to Disneyland to compete in a live trivia contest in front of Disneyland guests, and one person emerged from that as the Trivia Champion. I never made the top 10, but in my final year I did answer the most questions correctly in my District (in the Los Angeles area). 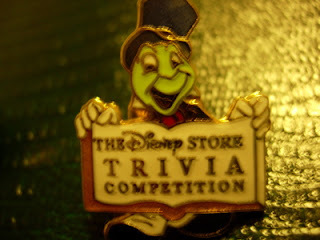 This pin features Jiminy Cricket holding a book that says "The Disney Store Trivia Competition". It took work to earn this pin, and I'm proud to own it.